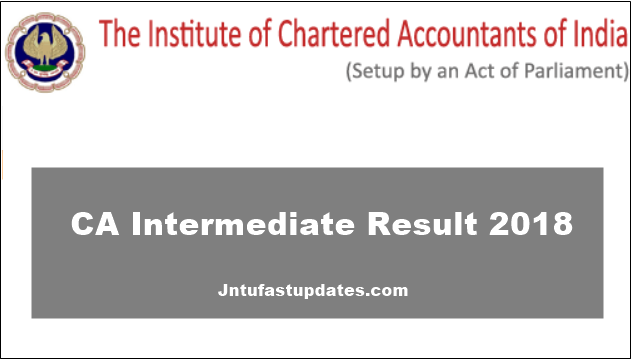 CA Intermediate Result 2018: Institute of Chartered Accountants of India (ICAI) will declare the CA Intermediate result May 2018 on 29th July at 6PM. Students can check their ICAI CA Intermediate Result 2018 at icai.nic.in or icaiexam.icai.org or caresults.icai.org. Result of the Chartered Accountants Intermediate Examination (Old Course & New Course) held in May 2018 are likely to be declared on Sunday. Arrangements have also been made for the students of Intermediate Examination (Old Course & New Course) desirous of having results on their e-mail addresses to register their requests at the website i.e. icaiexam.icai.org from 27th July 2018. All those registering their requests will be provided their results through e-mail on the e-mail addresses registered as above immediately after the declaration of the result. Further facilities have been made for candidates of Intermediate (Old Course & New Course) Examination held in May 2018 desirous of knowing their results with marks on SMS. The service available through India Times.